Rhonda Ellis is the first face employees and visitors see when they come across the Locust connector into the hospital every day. As a visitor monitor at the Locust desk, she considers it a privilege to be able to extend a piece of herself in the hopes of making someone else’s day brighter. It was 1972 when Rhonda first took a job in the housekeeping department at Akron Children’s after graduating from high school. During that time she competed in the local Miss United Way pageant and won. 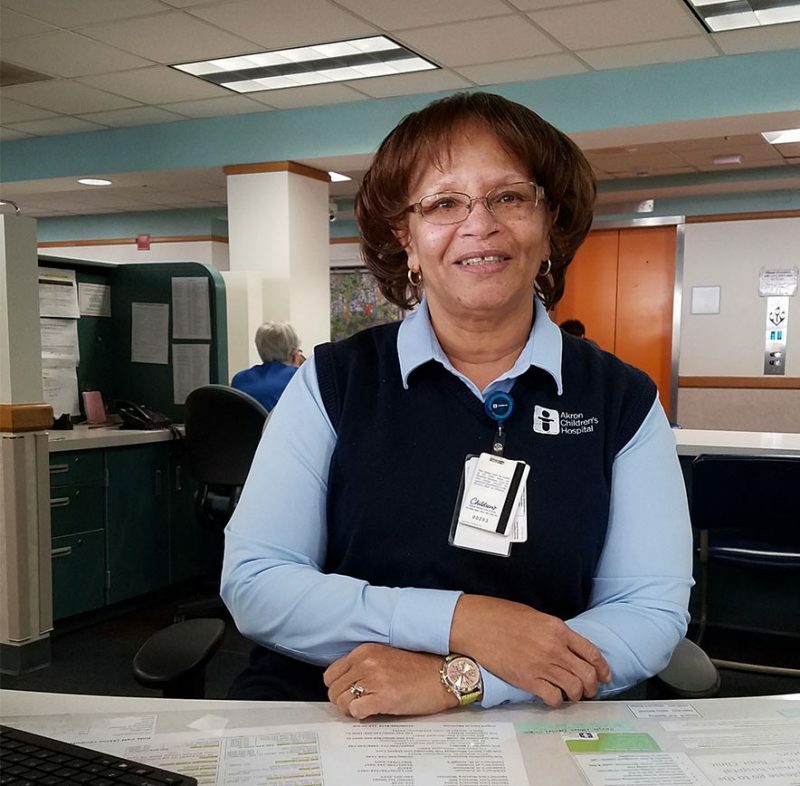 Feeling the pull to do something different, Rhonda left Children’s in 1975 to work as an admissions supervisor at Akron General Medical Center. After 5 years she took a job at a Cleveland hospital doing financial counseling. Eventually Rhonda transitioned her career into managing the business offices of local nursing homes for over 20 years. Her last stint included working in a home for handicapped children. When her mother’s health started to decline, Rhonda took a break from her fulltime career to spend time with her mom who moved in with her. In April 2015, Rhonda found herself back at the place where it all began. But it’s not just the patients and their families that Rhonda impacts on a daily basis. Outside of work, Rhonda says it’s her girlfriends and husband, J.C., who make her smile. She met J.C. in 2004 when she was a soloist at the annual ‘Gospel Meets Symphony’ fundraiser. “I performed in that event for 20 years and the best thing I got out of it was my husband,” she joked. The accomplished singer performed in the hospital’s Employee Foundation Council’s Harvest for Hunger Idol last year and her dream gig is to sing at a Cleveland Cavaliers game someday. “I want to perform the national anthem acapella at a Cavs home game – that would be a dream come true,” she says. Although her husband is set to retire in April from Summit County Developmental Disabilities Board, Rhonda has no plans to join him just yet.